I’m in love with the Casual Lady pattern! I just want to keep making these! 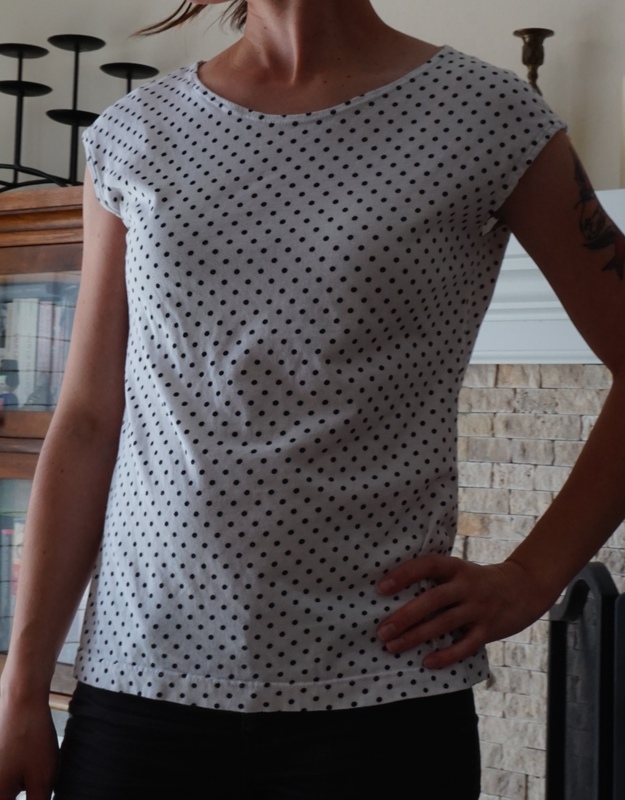 The first top I made was a size small, according to my measurements. I wanted to make a muslin first, so I found some super cheap jersey blend knit fabric at JoAnn’s for like $2. 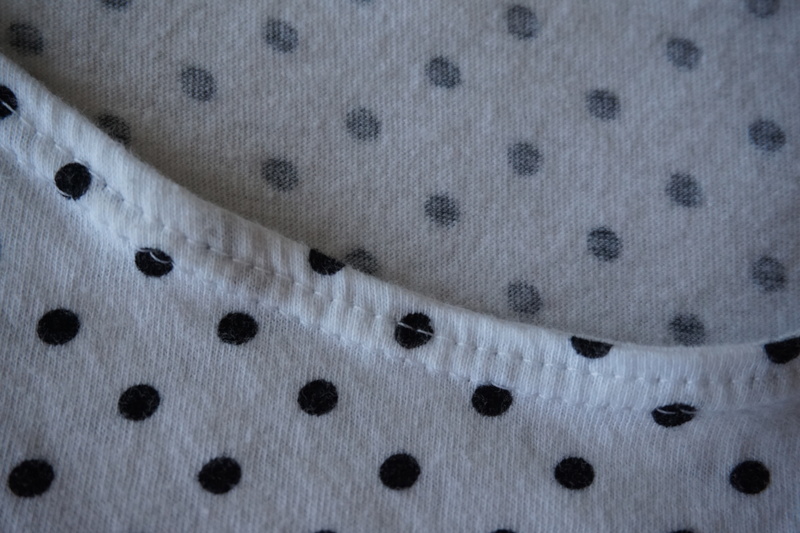 It’s really cute white with black polka dots, and even the cutting lady was like “Whoa! That’s cheap!”. I cut out the front and back pieces, including the facings and put it all together following the instructions (somehow I neglected to read the part in her instructions about not using thin knits for the facings). 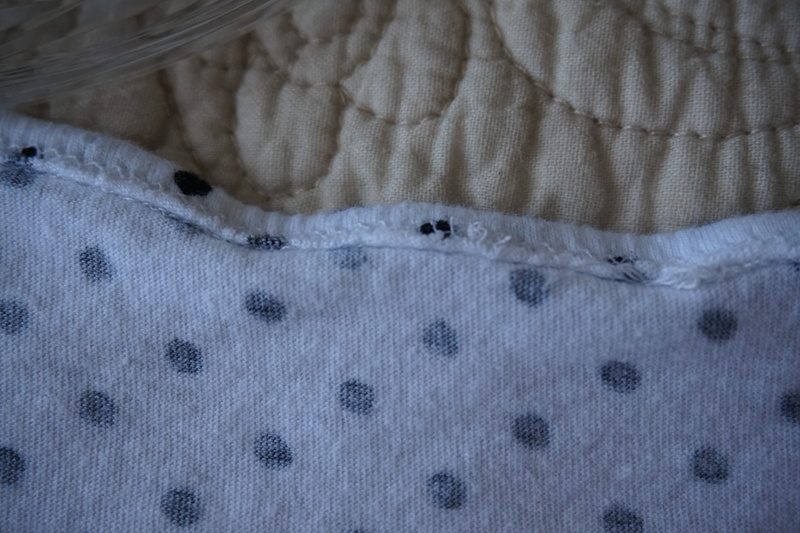 I serged the seams and used a twin needle for all of the hemming. I absolutely hated the way it turned out though. It was too frumpy, not at all like what I’d imagined it would be. I felt very disappointed. 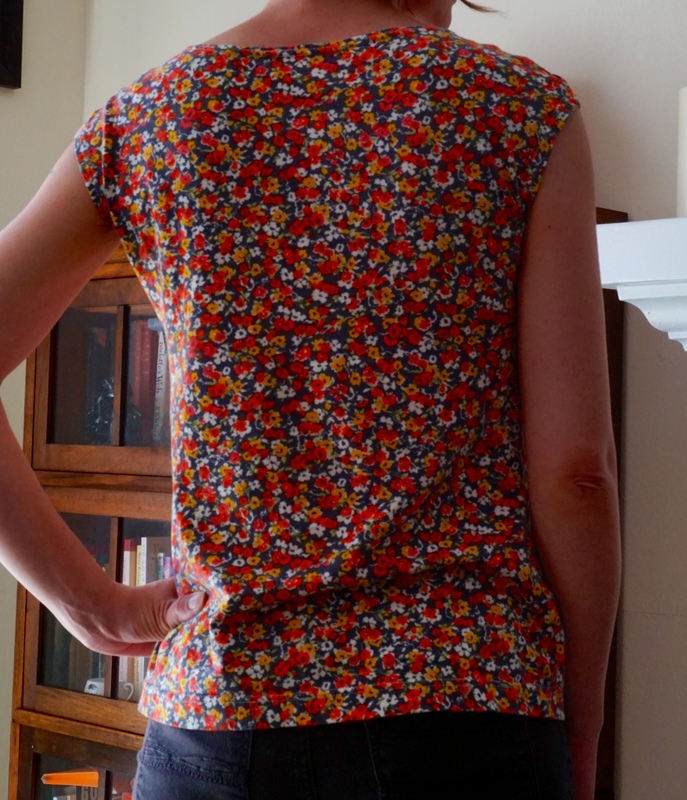 The neckline was all stretched out in the back too because I hadn’t used a walking foot when I was hemming it. After wearing it once, the facings were curling up so much that I cut them out. 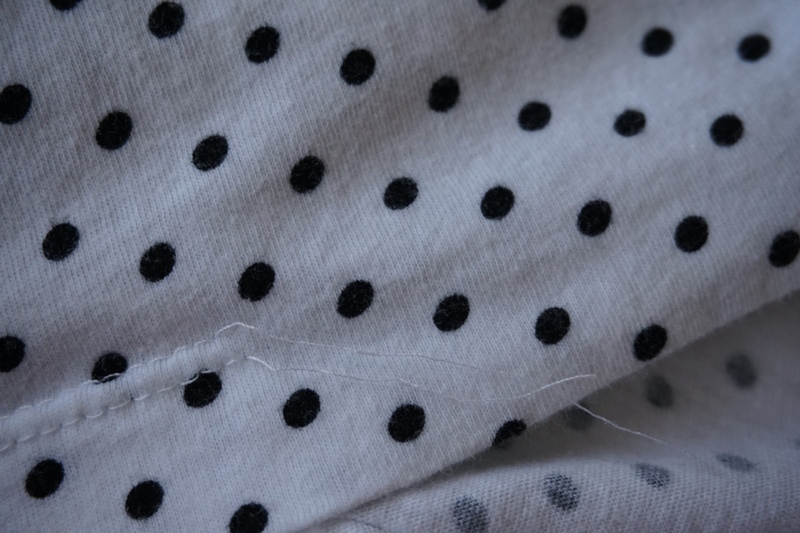 After wearing it repeatedly because I loved the fabric, the bottom hemline began to unravel. Can you feel my frustration? It’s sooooo annoying! After a couple of months avoiding knits (are you surprised really, look at all of those annoying pics 😉 I decided to buy the Janome CoverPro 900CPX coverstitch machine 🙂 In all reality, the thing that keeps me from whipping up my knit projects is switching to a twin needle, only to feel frustrated when it falls apart. The stretch stitch on my sewing machine is lame, so logically I decided it was time to throw my money into a coverstitch machine. I bought mine a few days before Seamwork’s knit issue came out (thankfully they “recommended” the one I had chosen as a good buy for the home sewer!! ), and I just felt like this was meant to be. 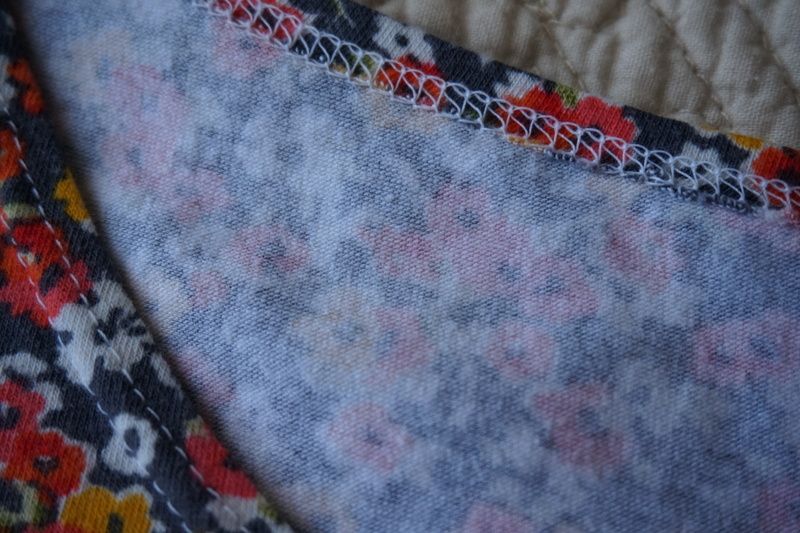 Then after letting my new CoverPro sit in its box for a few weeks, I finally decided to dig in and cut into some floral knit I had purchased awhile back from Stonemountain and Daughter. I pulled out the Casual Lady again and decided to go down a size. I serged all of the seams and coverstitched the hems, and I’m in love!!!! It can’t get any easier than this people. I did remove the facings this time. I just didn’t like them. 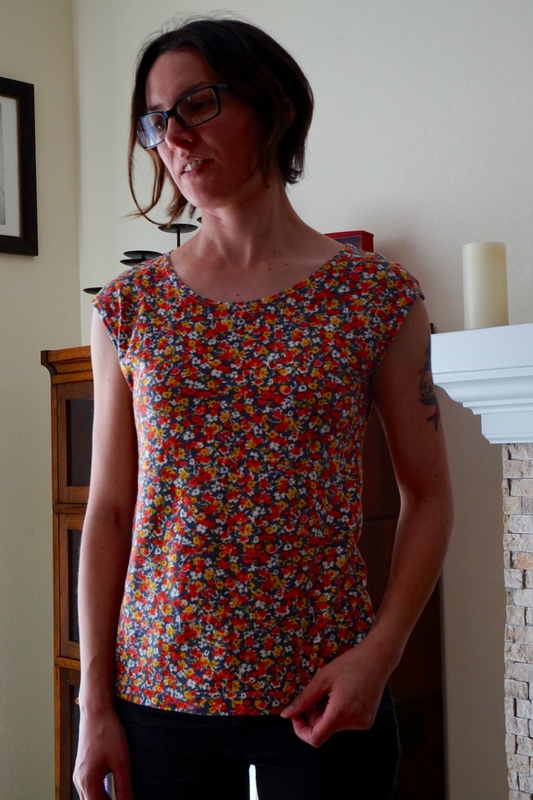 I turned the neck hemline down and just stitched with my coverstitch. This was exactly what I pictured when I bought this pattern! I love the fit (although I might need to do a sway back alteration after looking at these pics, any thoughts? ), and it looks good tucked in or out. 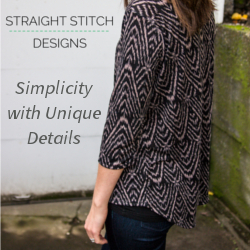 Are you tempted to buy a coverstitch machine? They are pricey, but for myself, I saved up and know that I’ll be much more productive with one. I decided on the 900 instead of the 1000 because I figured the extra cost didn’t justify the extra features. I did do a lot of research before buying the one I did though, and sat on it for a long time before finally pulling the trigger. So far I’m very happy with it though!